And while we often suggest that price shouldn’t be the main driving factor in the decision to get new windows, or which windows to get, there is no denying that it is very important. So, how much should you be paying for new windows in Edmonton? Think of your windows as a long-term investment. It may seem outright daunting when you have to spend thousands of dollars to get new windows. But if you consider that quality windows should last you around 25 years, the processes and components involved have to be of a certain quality standard. Installation type makes a difference. There are only two types of window installation: full-frame and retrofit. A full-frame installation is more thorough and is usually recommended for residential replacement windows, but it can also cost up to 20% more. Remember, correct installation is essential to the longevity and performance of your new windows. Window type matters. Customers and even window companies sometimes debate whether to get triple-pane or double-pane windows. What is more important, is that windows you get are ENERGY STAR rated and are considered efficient in your local climate zone. In order to be considered efficient in Edmonton, windows must meet requirements for climate zone 2, and have a minimum ER rating of 29. Many window companies in Edmonton will outright lie about the ratings of their windows, or try to make the customer believe that they don’t need windows that are rated this high. The truth of the matter is, rated windows are much better and will last you longer. Of course, they also cost more than the imitation. But in turn you get the security of knowing that you paid for a quality product that was built in accordance with all standards and regulations. What kind of window installation is right for you? As it is, there are two main types of window installation in Canada: a full-frame (brick to brick) replacement, and retrofit (insert) window installation. These installations differ in how thorough they are, and as a result, there is a price difference as well. On average, a full-frame replacement costs roughly 15-20% more than a retrofit. So which installation should you pick? In reality, you may not have much of a choice. 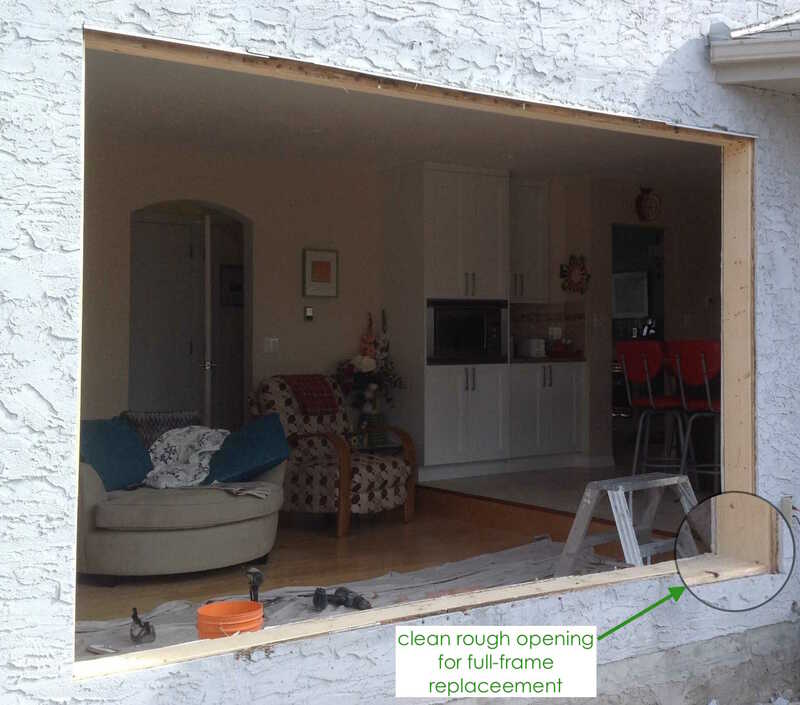 In a retrofit installation, the existing frame of the window remains intact. The old window sashes are removed and replaced with new sealed units. This installation type is not advisable if the wood framing around your windows has moisture or mold damage. Unfortunately, that is often the case with older prairie homes. In this case, a full-frame replacement is recommended. A retrofit will simply be a band-aid solution that will need to be remedied again when the frames fully rot out. A full-frame replacement takes care of all the structural issues in the frame surrounding the window. A good installer will fully remove the existing window, clear the opening and look out for signs of moisture damage. A new frame, window, jambs, and brickmoulds are then put in and sealed off from the elements. This makes sure that the window is protected and sealed from the outside and inside. Unfortunately, not all homeowners can recognize the difference between two installation types. Beware of companies that will try to pass off a retrofit as a full-frame replacement: they are charging double for half the work. Just like there are two types of window installation, there are two main types of vinyl windows when it comes to pricing your replacement: crank (casement or awning) and sliding or hung windows. Crank windows can cost up to 20% more than sliding ones. But why? The answer is simply that they are more efficient. Modern crank windows use compression seals in the area where the moving sash meets the frame. These are areas where drafts and leaks are most likely to occur. A compression seal creates an airtight unit when the window is closed and prevents warm air from escaping your home. Slider windows and old casement units rely on weather stripping, which is not as effective and, therefore, makes for a less efficient window. Another advantage of crank windows, is the ease with which they can be opened and closed. Many people don’t consider it, but sashes in modern vinyl windows can get quite heavy, especially if it is a triple-pane unit. In sliding windows you have to move the sash by hand, which can be difficult as is, and especially so if the window is in a harder to reach area over a sink. Casement and awning windows rely on crank technology to move the sash. Crank windows require roughly 1/10th of the force to operate. Because you’re not pulling on the sash all the time, the window also won’t deform or bow as it can sometimes happen with sliding windows. If you really want value from your replacement, and would like to ensure that windows actually add comfort to your home, consider getting windows that are ENERGY STAR rated. In Canada, Energy Star outlines three distinct climate zones. In order to be considered efficient in each zone, windows must meet specific rating requirements. In order to be considered efficient in Edmonton, windows must have a minimum ER rating of 29 and qualify for climate zone 2. Unfortunately, many companies lie about the quality of their windows or try to convince customers that they don’t actually need windows for Zone 2. Fortunately, all companies whose windows are Energy Star rated can be found on this Natural Resources Canada website. While it is difficult to get an exact price for a window over the phone, or just by calculating the window sizes, most local window companies should still be able to give you a price range. Based on their services, and quality of their products, these companies often fall into different price categories. We have compiled a list of the top Edmonton window companies and the price ranges they fall under. Window Prices in Edmonton Overall rating: 4.9 out of 5 based on 41 reviews.